Since becoming parents to three, buffet-style eating as definitely become the only way to eat out as a family. With the Red Hot World Buffet and Bar being found in more and more city centres, I know we're not alone in this preference. Being able to walk into a restaurant and fill a plate quickly with enough to satisfy three children whilst the grown ups take their time to enjoy three courses is an absolute revolution if you've tried to enjoy a meal in a waitered restaurant. As a result Mr J will choose a buffet restaurant even for our 'date-nights' because it means whether one of wants three usual sized courses and the other wants a few more smaller portions, it always ends up ok.
You can probably guess how excited I was to become one of the Red Hot Tastemakers. 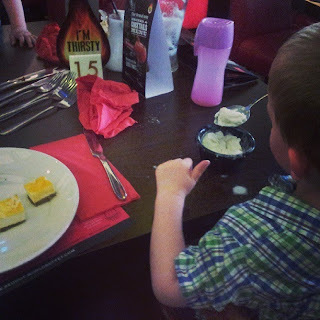 The Red Hot Food Buffet was a preference on our day out with the boys, and it was a friend's choice when he asked if Squeaks would be there for his daughter's birthday. And so, to celebrating becoming a Red Hot Tastemaker, we're sharing the joy! Kids aged 16 and under eating for half price!! That’s from as little as £3.99 for limitless pizza, pasta, curry, salads, desserts and ice cream (prices vary according to restaurant, day and time). We'd definitely recommend checking out the offer. So, with a birthday on the horizon, I'm definitely looking forward to getting Mr J out on another date night! Disclosure: This post was written as part of the Red Hot Tastemakers programme.